Today's post was written by my younger sister Stephanie, who is very giving and a little sassy, happens to be my favorite coffee barista, and is the photographer extraordinaire behind Steph Zimmerman Photography. I'm so excited to share her thoughts with you today as part of my Why Make Beautiful Things Series! Beauty can be found in a simple photograph. A photo not only captures a moment, but it is a constant reminder of the emotion that you felt in that moment. The way your husband gazed at you on your wedding day. The photograph of that unforgettable family vacation. A sweet moment captured of your little one. It deserves to be preserved not on a CD, but on paper, to be shared with generations to come. I've never received the compliment, "that photo looks great on that CD in your drawer!" Never. Not once. And I know that I never will. I have, however, had guests in my home exclaim over the beauty of the family photos that are hanging on my walls. One display in particular has received the most love. On the other side of our living room I have a picture display rack (a thrift store steal). I am so thankful that I found it, otherwise this wall would be held together by paint and putty only. I constantly am changing these photos and this allows me to rearrange to my hearts content. New or used, its a great investment for your walls. I have so many photos hung on our walls... they are what help to make our house a home. 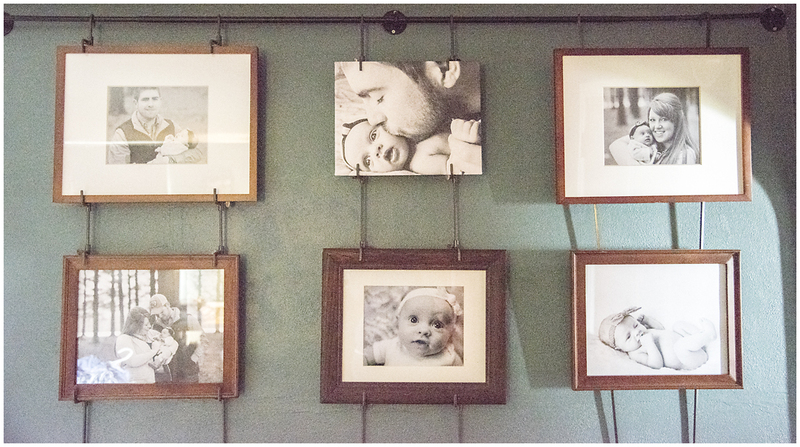 We're constantly surrounded by photographs of those we love and the memories we share with them. 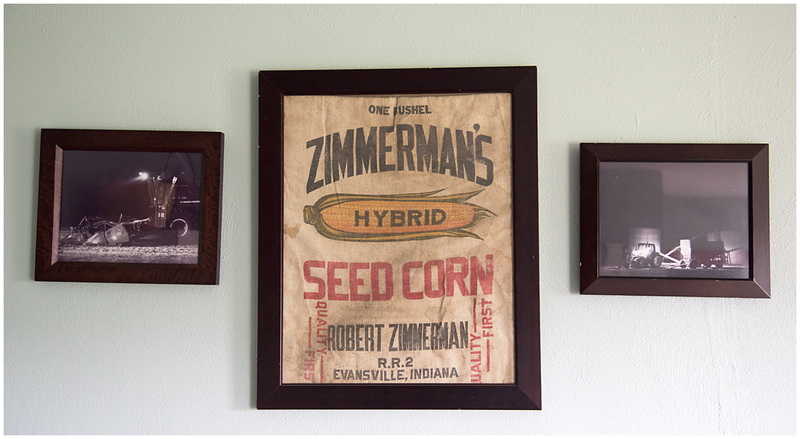 The above frames hang in our bedroom. The first image of Steven and I was taken shortly before our wedding ceremony. We were (and still are) so beyond happy to be with each other as husband and wife. We were nervous, but didn't care because we were going to finally be wedded as one. 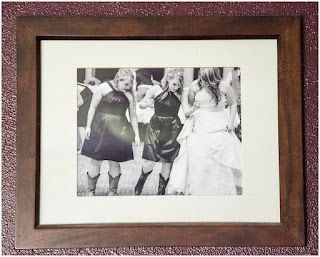 The last photo in that row is of my sisters and I line dancing at our wedding reception. It makes me happy to remember in that moment, we were laughing hysterically at one another because we couldn't remember all of the steps. We struggled for a little bit, but eventually got it and danced to the rest of the song. Our wedding photographers nailed that moment perfectly. The two photos in the middle were taken a few weeks after our first anniversary, and we had grown so much in those twelve short months. I love them all. In our kitchen we have a couple of photos that I took of Steven and his dad during harvest two years ago. Steven is a farmer, I come from a farm family, and we love agriculture. The photos are anchored by a Zimmerman seed bag (random eBay find, no relation) and are the view from our kitchen table where we share meals together. I've adorned my daughter's wall with images of us as a family and images of her as she grows. I know she could care less right now. But I love them now. She will love them later. And my grandchildren will probably love them even more. Really... who wouldn't want a series of faces they they made as a baby? I have one canvas hung in our little hallway. It is of Garden of the Gods in Colorado. I think it is a lovely image; but to me, it's not just a pretty picture. I remember Steven and my brother-in-law, Luke, having a great conversation and enjoying one another on the balcony outside of the visitors' center. 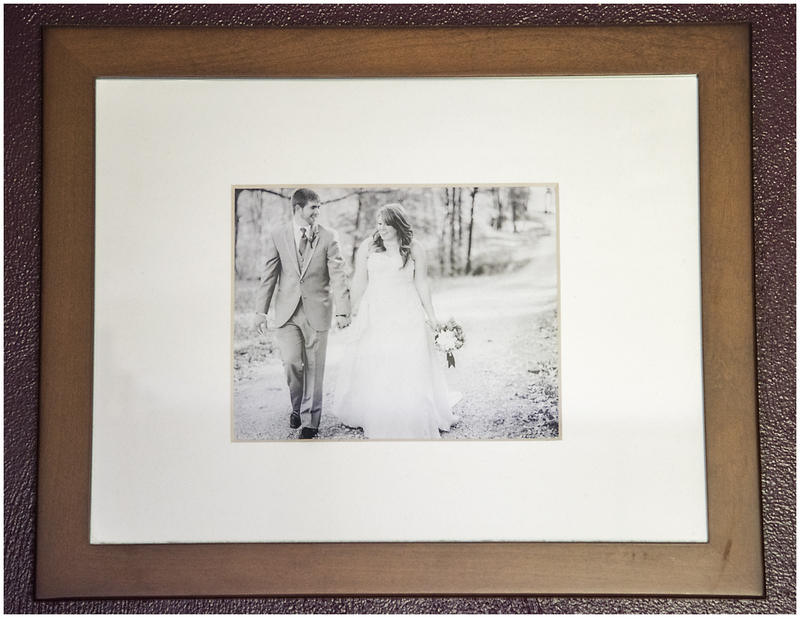 Not all of your prints have to have people in them to remind you of your loved ones and those treasured memories. 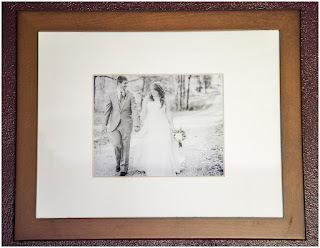 Having your pictures beautifully (or not so beautifully) organized on your computer is a lovely thing, but please print those photos. With technology today, we take photos all the time but often never print them. We share photos on Facebook, in blogs, on Instgram, etc. and they are buried behind other posts the next day. Be that person that prints the photos. Hang them on the wall. Add them to an album. Print them for your children. Print them for your grandchildren. Print them for you. Believe me, your family will love you for it. 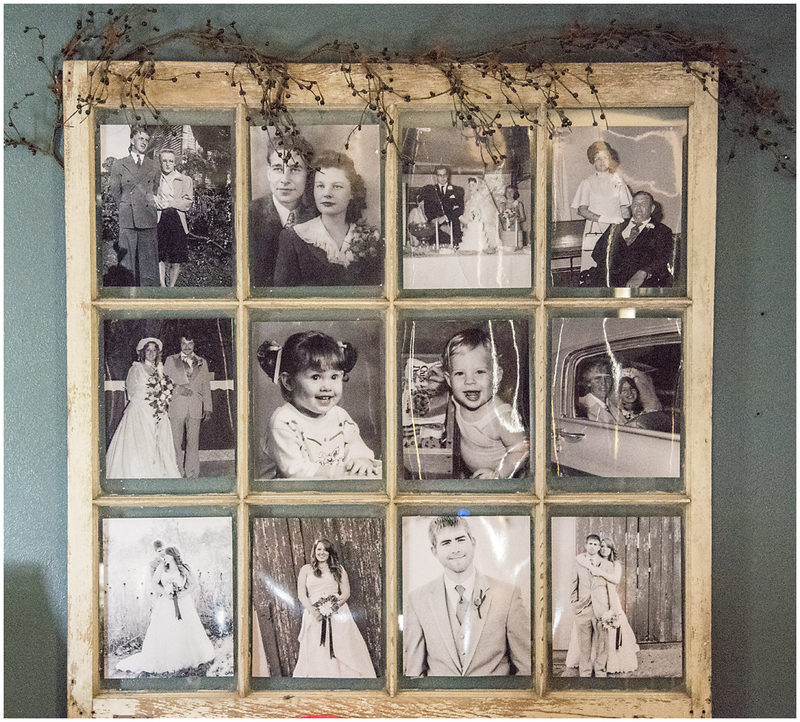 We love to go through our family photos from previous generations. It's a blessing to see those moments captured of our grandparents at a time when we did not know them. It helps us to learn more about them and their time here on earth. It helps us relate to them at a time they may have been the same age as we are now, in the same stage of life. I honestly wish I had a bigger house, a main reason being to have more wall space for more photographs. The moments that are captured and printed on paper will always be treasured. You won't always have (or in my case, fit) into the t-shirt you got on your 8th grade trip to Washington, D.C. I do however, have the pictures (lacking in quality, as they may) of my friends and I touring the city and visiting the historical monuments. I was awkward and didn't know how to do my hair, but I still treasure those goofy photos. 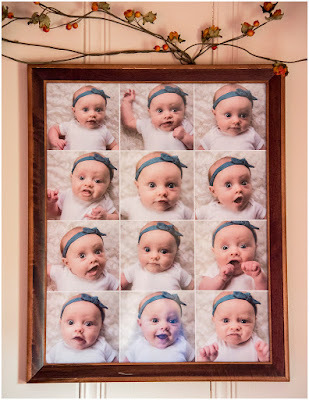 As mom and photographer, I understand the importance of printing the photographs that I take. I hope that this little post has encouraged you to do the same for your friends and family. 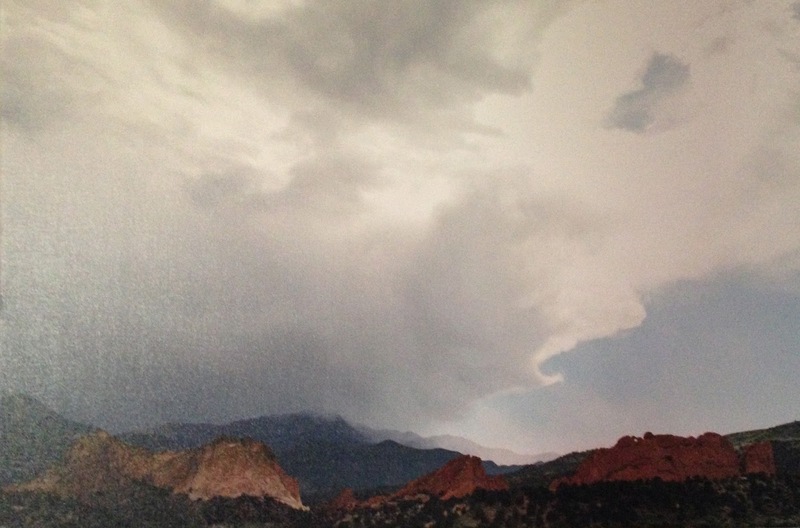 Add some extra beauty to your home and life with beautiful photographs. Whether they are professional or a snapshot, please print them. I promise you won't regret it. 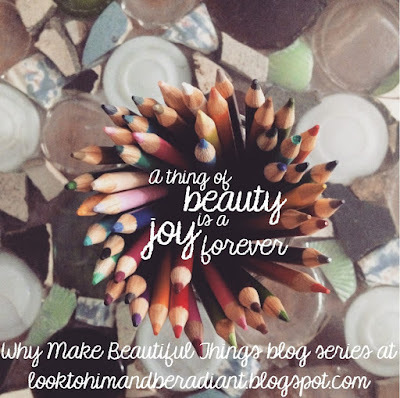 Steph's post is part of my Why Make Beautiful Things week. -Read my thoughts on the seven reasons why making things beautiful matters here. -Visit my Granny's Closet post to see pictures of the beautiful and fun vintage dresses (which used to belong to my Granny!) that I have been wearing this spring. -AND come back on Sunday, because I'll be hosting a special giveaway with seven beautiful items that I know you are going to love from Kayla Phillips Design, Steph Zimmerman Photography, and [un]common workbasket. You don't want to miss it! So I'm a little behind in reading blog posts... after our parish's Summer School at the end of May (Katie, I used a bunch of your ideas again with my 5-6 year olds! ), I started on a project to organize and back up my digital photos, and I would really like to print "books" to have hard copies. I'm struggling with the best way to do that, though - and I wondered if Steph might have any suggestions. I'd like something rather plain (not scrap booky) - just a handful of photos on a page with brief captions. Any suggestions on how to logistically make that work? There are a couple of options you could go with. You could either find an online printer and design it yourself or you could hire a photographer to create and album design for you. If you have the time, an online printer (my favorite consumer printer is www.mpix.com) would be a great option. They are user friendly and allow a lot of flexibility for your designs. All you do is upload your images and arrange to your hearts desire. Some printers are better than others, so you could look at reviews online to decide which you would like to use. This is definitely something worth investing in so you can treasure it for years to come, quality is important so that your albums last. Good luck and have fun!